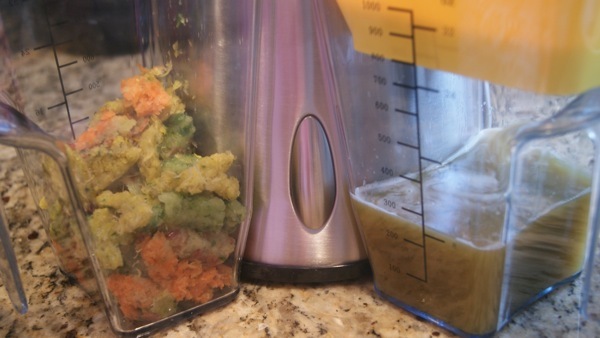 Most people know there are many benefits to juicing. 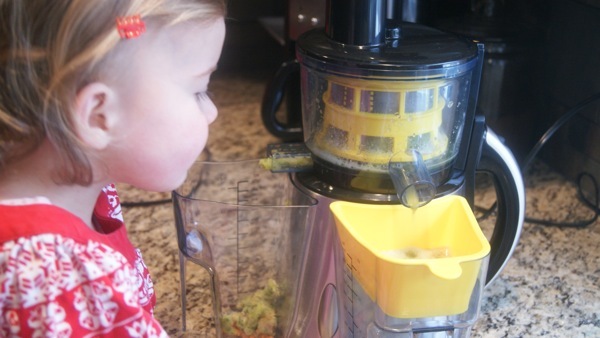 It’s a great way to pack in tons of nutrients from real fruits and veggies in one cup! What people don’t realize is that it’s not as time consuming as you would think. 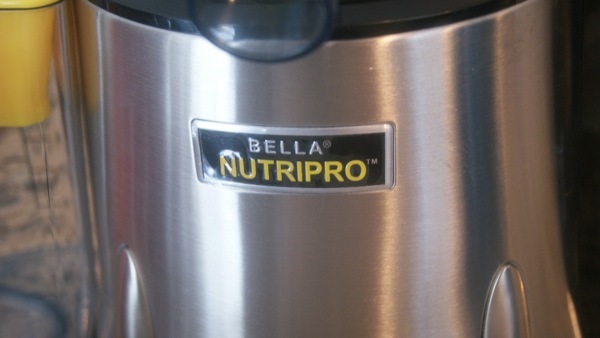 I was recently sent the Bella Nutripro Juice to try and review and I was so impressed with how easy it was to use. It seems intimidating because it has a variety of different looking parts, but I assure you, it’s not. I think after using it a few times Anna would be able to put it together (not that I would let her). After getting things set up and rinsed, we immediately started going to work. 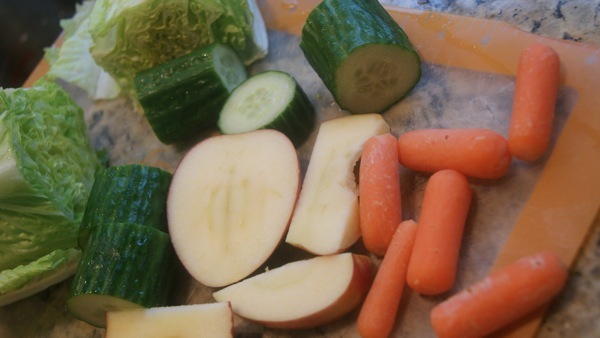 I chopped up a variety of veggies we had in the fridge and a partial apple that Anna had started eating. 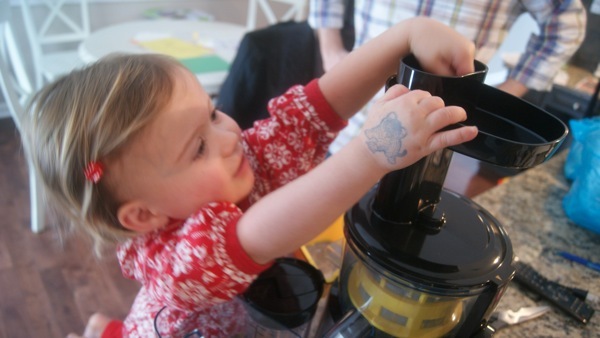 Then we watched as the juicer did all of the work. I was so amazed at how much juice it made. The pulp was really fun to watch too. I didn’t save it this time, but I plan to next time. 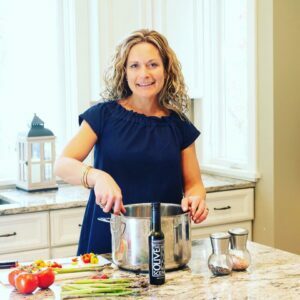 I have seen some great recipes for using it up! The colors and flavors were strong and so fresh tasting. And the clean up was simple. Everything got washed and set on a towel to dry. It came apart and went back to together simply so it did’t seem like a big project. 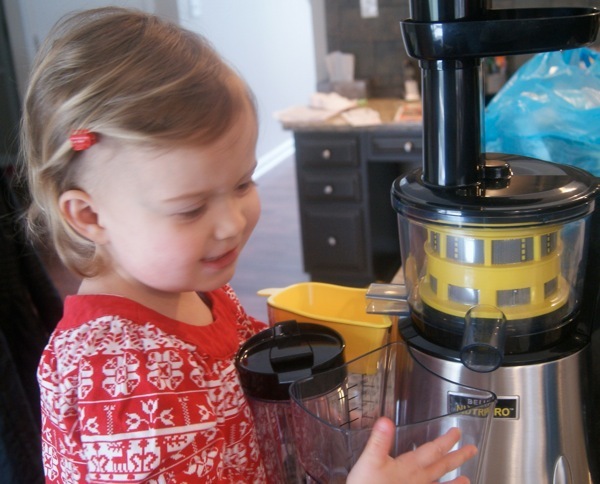 Overall, I was really impressed with the juicer and I am excited to try new combination and recipes with it! I think it will be great to get more fruits and veggies into Anna and Baby #2 when they are here! It’s an easy way to meet your fruit and veggie quotient. Many Americans don’t consume enough produce, so juicing those fresh ingredients is a quick, easy way to meet your recommended daily needs. Cold press juice is healthy fast food—a meal on the go that’s good for you. It hydrates your body. H2O isn’t the only way to replenish the fluids your body needs. Cold press juice is a savvy way to quench thirst and keep your organs functioning properly—it’s like nature’s first vitamin water. For best juice cleansing results, drink 1 quart daily for 2 days. Tip: Have a large, 4-quart pitcher or spouted bowl on hand. Cut cucumbers (with skins) in lengthwise quarters/wedges. Cut green apples, lemons and fennel into 1-inch chunks. Alternate feeding cucumbers, apples, lemons, fennel and tightly rolled chard and parsley (with stems) into the hopper. Stir carefully to mix juice. Store remaining juice in airtight sealed containers. For a fresher taste, it should be consumed up to 72 hours after preparation. Add the zest of 2 lemons to a pitcher of cold spring water and stir well. Peel and seed lemons. Cut into chunks. Cut unpeeled ginger in chunks. Alternate feeding ginger, strawberries and lemon chunks into the hopper. Pour fresh juice into the pitcher and serve. IMPORTANT: Almond skins taste slightly bitter. Almonds should be pre-soaked and skins removed, to produce a white almond milk with a pure, sweet taste. Add raw almonds to the handled container and cover with water. Allow nuts to soak for at least 8 hours. Drain the water into another container and reserve almond water. Squeeze each almond, then rub the nuts to remove the skins. NOTE: If almond skins are difficult to remove, place the nuts into a large bowl, then pour 2 cups of boiling water over the nuts. Allow to sit for 5 minutes, then drain and discard this water. Remove almond nut skins. 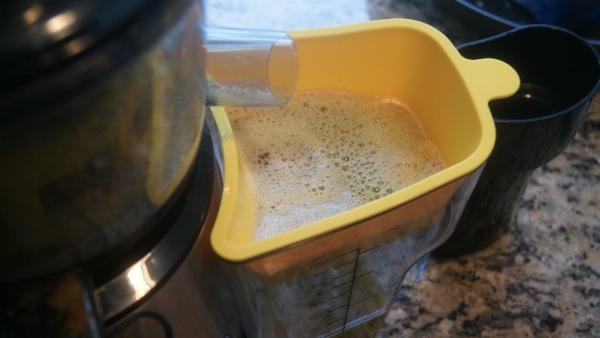 To prepare almond milk, add equal parts reserved almond water and skinned almonds to the Cold Press Juicer hopper. NOTE: Add more or less almond water to adjust thickness or creaminess of the milk. If a smooth, light milk is desired, place a cheesecloth or sturdy nut bag into the handled cup. Pour almond milk through the cloth, then squeeze to extract filtered almond milk. This step is optional. 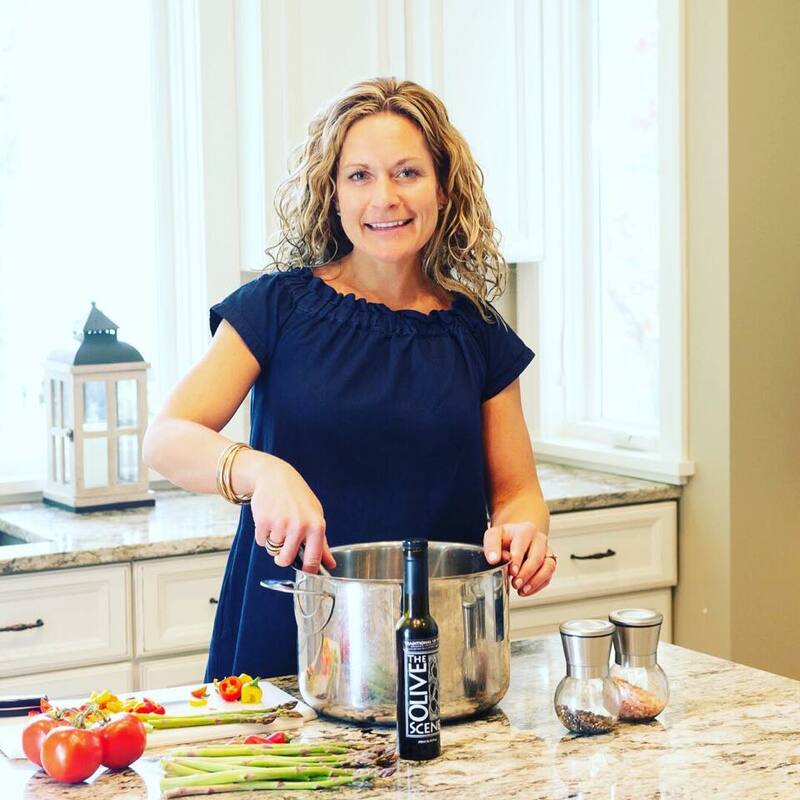 Check out the NutriPro Juicer on Facebook, Twitter, YouTube, and Pinterest!